Review: Under the Mesquite and Summer of the Mariposas, McCall’s previous books, are fantastic works of storytelling. Her writing is lyrical whether she’s creating prose or poetry. Having read and loved her first two books, I was predisposed to enjoy this newest novel. In addition, as a former resident of Texas, the story immediately caught my attention. Though I lived there for sixteen years, my knowledge of Texas history was sketchy at best so this seemed like an excellent way to find out more about my former home. The story along with the thorough author’s note was eye-opening to say the least. 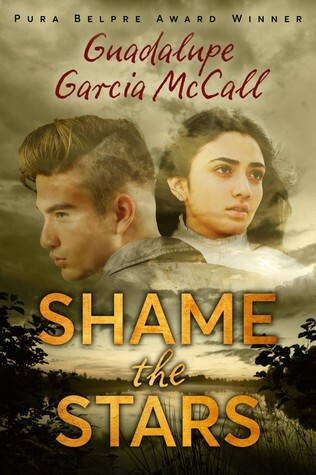 In Shame the Stars, McCall shares a part of history not often covered in our school history texts. The conflict might be mentioned, but it is highly unlikely that students would learn about the lynchings, executions and other atrocities. This novel is one way to learn some of that missing history. The story begins with Joaquín expressing his frustration at the way tejanos are treated and how their rights are being trampled by the Texas Rangers. Over time Joaquín witnesses more and more injustices by Rangers. They see no need to have a search warrant, they kill without trials and behave as if the law does not apply to them. For Joaquín it seems that danger is surrounding their community and he and his father have very different ideas about what to do about this. One way Joaquín deals with his feelings is through writing poetry. Most of the story is told in typical narrative style, but every so often a poem, a newspaper clipping, letter or other snippet of text is included. I appreciated the addition of non-traditional texts. These felt like primary sources and made it seem like readers could see a piece of the past. Beyond this unveiling of history, the story is also a romance. Joaquín has loved Dulceña for years and falls more deeply in love with her as time passes. She loves him too, but makes it clear that she doesn’t want the role of damsel in distress or quiet little lady to be tucked away at home. She’s an intelligent and brave young woman who has dreams of her own and she will not let her dreams be ignored just because she’s female. I appreciated her and the other strong women in this book. There are women leading and fighting for their families and communities in many ways. The book is often compared to Romeo and Juliet not only because of the great love between the two young people, but also because their families are at odds. The families have been very close in the past, but both fathers have completely different ideas about how to best protect their family in dangerous times. The break between the families is a result of love and protection rather than a hatred for one another and that makes it all the more heartbreaking. Recommendation: Get it now. This is an intriguing historical romance that will leave readers with much to ponder. Shame the Stars presents a beautiful love story set against a backdrop of deadly conflict.